Warmup freeze protection cables can be applied to pipes, ducts and water lines. 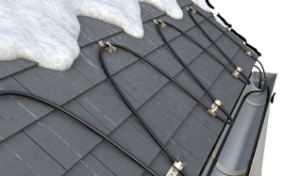 Designed to keep pipes free of snow, our self-regulating cable gives you peace of mind knowing that your home or business is protected from the potential damage caused by frost. This product is constructed of a self-regulating polymer core that varies its output along its entire length. The self-regulating wire is ideal for pipes freeze protection applications, as it regulates its output depending on the ambient temperature, making it more energy-efficient to run. It’s well suited for both residential and industrial applications and can be installed indoor and outdoor. The TF115 is a simple on/off controller activated below a certain pre-set temperature. Below that temperature, it turns on, and once the weather warms up, it turns off. For under $200 it is the safest and simplest solution to control up to 500ft of cable. In more advanced situations or commercial applications, this timer panel with a 252A capacity can be operated manually as Timer, or combined with optional sensors. It has a load capacity of 2x63A/4 pole. The WSM-63 provides an all-in-one solution to control pipe protection systems. WHICH CONTROL FOR YOUR PROJECT ? NAM-LABEL+TAPE Sold in roll of 66ft. Includes 10 caution labels. NAM-SPLICE-KIT Spice/Tee kit for Self-Regulating Cable. SPEEDFIT-BOX In-line splicing box for fast and weathertight connections in the field. SPEEDFIT-TEE 3-Way T-Splice box for fast and weathertight connections in the field. SPEEDFIT-SPLICE In-line splicing box for fast and weathertight connections in the field. Protect outdoor areas to improve accessibility and avoid accidents. Protect your roofs, gutters and downpipes from snow and ice.